To add a Team to Association Registration form, follow these simple steps. 1. 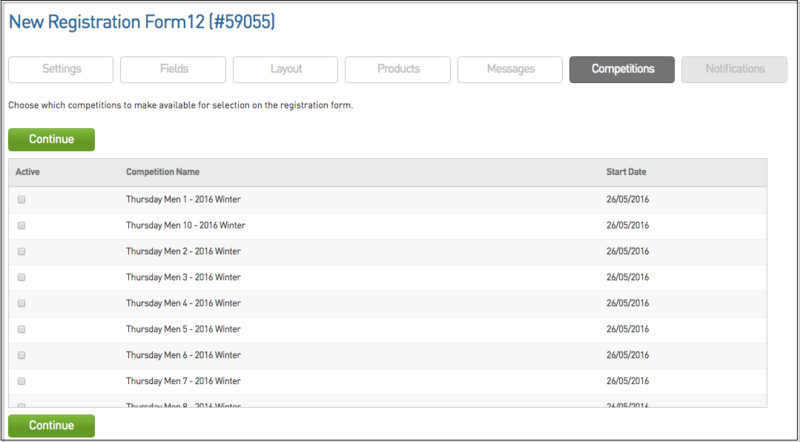 Hover over Registrations and click 'Registration Forms'. 2. Click on 'Add a New Form'. 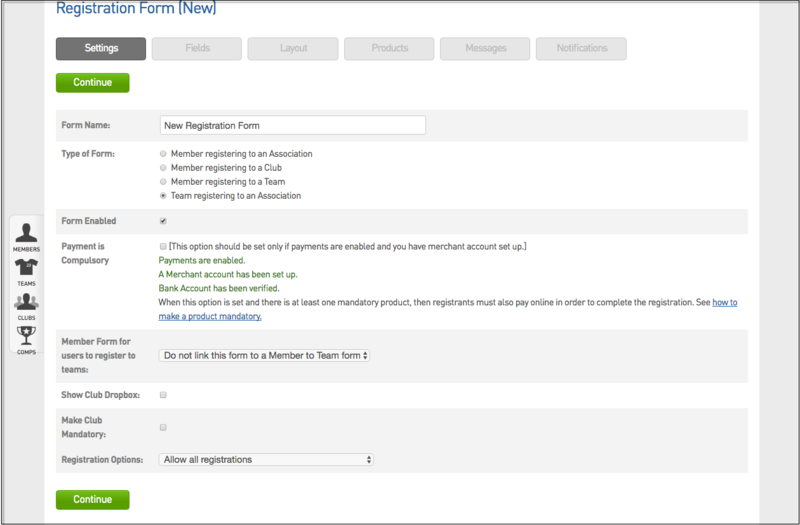 Select Type of form - Team registering to an Association. Ensure the Form Enabled box is ticked. 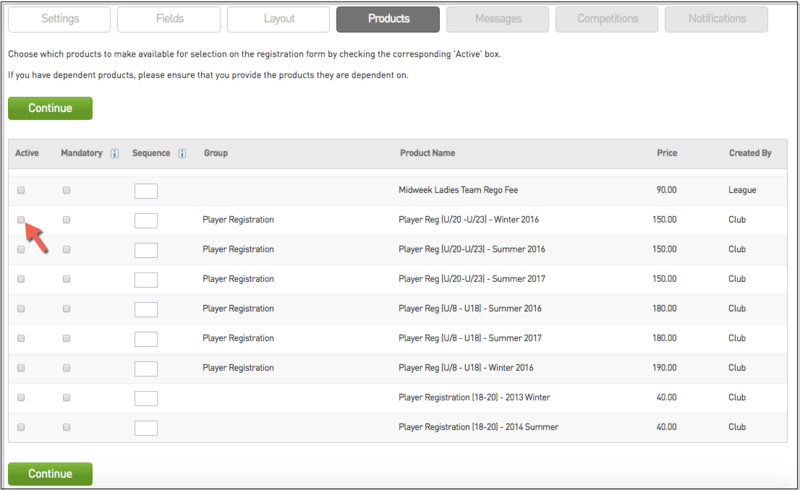 If you wish to receive individual team member registrations ensure you have created a Member to Team form previously and link the name of the Member to Team form via the drop down box. If you run a club structure its important that you select the checkbox for Show Club Dropbox. You should also click on the Make Club Mandatory checkbox. Determine your registration options – new teams only, returning teams only or both. 4. 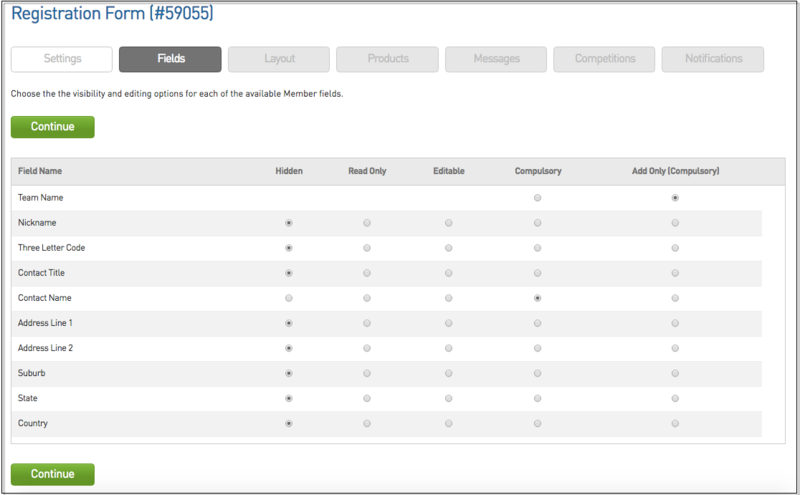 On the Fields page, select the Fields you wish to make Editable and Compulsory. 5a. Header blocks can be added in order to break up sections. 5b. Text blocks can be added to add additional descriptive text to a section. 6. On the Products page, select the 'active' box of any products you wish to add to the form. 8. The next page is the Competitions page. If you have not setup your shells of your upcoming competitions that’s ok. Proceed with completing the form and then come back to this section. We do recommend you setup your shell competitions first and then check the boxes of the competitions you wish to open for team nomination. Once selected these Competitions will show on the form under the question - 'Competition to Join'. 9.The next page is the Notifications page, indicate via clicking the check box any appropriate stakeholders who should receive notification of a Team Registration.